“Having waited for what seemed forever for winter to turn up Simon Frost and myself drove up from Liverpool on January 20,” Dave Almond writes. “After a 4.30am start to walk over to Shelterstone to find it looking black we ended up in Coire an Lochain to have a play on Mick Fowler’s route Procrastination (VII,6). I had been told it may not have had a repeat winter ascent and had repelled some talented teams. It certainly wasn’t like the more heavily travelled Northern Corries routes where the placements are dug out. We had a great time on it – the grade is perfect and I would recommend. 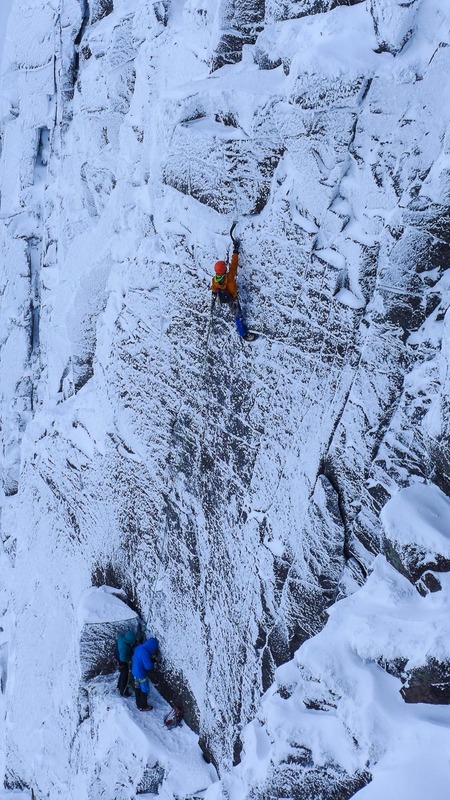 The following day (January 21) Helen Rennard joined us for a blast up Omerta (VIII,9) Coire an t Sneachda. Helen led the first pitch giving me plenty of opportunity to take in the slightly overhanging, thin crack lines of the second pitch. It’s fantastic climbing with powerful moves from the often hard to place protection above a big ledge that encourages you to hang on tight to your axes. I was going really well until the last pull into the niche at the top of the wall when my axe ripped. My randomly placed cam held and I quickly jumped back on and finished the pitch. Si Frost had a go on the last pitch but after getting half way up he handed the reins over to me to finish. Despite us reading that it was a grade easier we thought it was the similar in difficulty to the crux pitch. We were all really impressed with how sustained the route was and the skills of Martin and Pete in finding and making the first ascent. After taking a day off climbing due to food poisoning, which wasn’t a pleasant experience, Helen, Richard Kendrick and myself headed up to climb The Duel in Stob Coire nan Lochan on January 24. Again Helen led the first pitch and I led the second. The Duel crux offers more technical climbing as opposed to the thuggery of Omerta. Richard opted to turn the route into the third ascent of En Garde IX,9 and we all had great fun in the big exit chimney still finding a use of that No 6 cam we had dragged along for the top pitch of The Duel. This entry was posted in Repeats and tagged Dave Almond, Helen Rennard, Northern Corries, Richard Kendrick, Simon Frost, Stob Coire nan Lochan. Bookmark the permalink. I’ve done Procrastination, by the way. 1988? Ok, it was me who told Dave ‘I’m not aware of any repeats’ since I knew of several failures! I bow to the more experienced knowledge of the above…..then again, this isn’t really my area of expertise!